EIC or Exercise Induced Collapse is a genetic disorder that causes dogs to lose control over their muscles after a phase of the intense exercise. The symptoms start emerging in between 5 months to 3 years of age. High-intensity training generally begins at around 5 months of age and your dog may or may not be affected since it completely depends upon its genetic structure. Activities such as chasing, running and hunting could trigger EIC and episodes are known to last for 5-25 minutes. While it is generally manageable by studying the triggers that cause it, it could be fatal if the attack is intense. Learn all about EIC here so that you can deal with episodes more efficiently and help your dog to lead a normal life. A dog needs to have two copies of the mutated gene to be impacted by EIC. If your dog has one copy of the mutated gene, then it will only be a carrier and might pass on the mutated gene to its offspring. However, if breeding takes place between two carriers, then the offspring has a high probability of inheriting the mutation and be impacted by EIC. If your dog suddenly pauses in between high-intensity exercises or activities and starts rocking, it could be the first symptom of EIC. The rocking is usually followed by weakening hind limbs and passing out. The symptoms could vary from one dog to another. Some might make every effort to recover right away by trying to drag along their hind limbs while some others might stop all activities right away. Affected dogs might also have elevated body temperatures that further worsen the situation. ​What Breed Is Most Commonly Affected? If your dog has been recently diagnosed with EIC, then it would definitely take time to sink in but there is a lot of hope at the end of the tunnel. Dogs with EIC do live full lives. The only thing that you, as a pet parent, will have to do is thoroughly study the triggers and keep them at bay. Another significant way to find out and prevent the triggers is to get a DNA test kit and test your dog for EIC as early as possible. Even if your dog does test positive for EIC, you might manage to prevent all episodes by being selective about exercises and activities. While EIC cannot be treated permanently, it can be avoided and anti-seizure medicines could help in severe conditions. Finding out exactly why your dog has a foul breath, is important as it could signal underlying health problems. Having a new pup in your home is such an exciting event, however, all too often we don't realize that we need to teach our dogs how to spend time happily by themselves - not to do so, leads to an over dependent dog and possible separation anxiety. 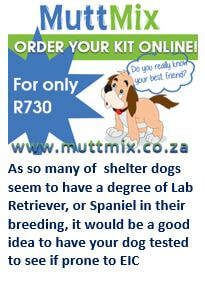 There are a lot more reasons for finding out what your cross breed is, than you may have thought about!